but when I saw this bunny set I just had to have it. P.S. Bunny-shaped clouds in middle photo are made with Photoshop Cloud Brushes created by Pixlpusher (I just used a small one to draw bunny ears on...)Thanks for making such fun brushes Pixlpusher! Dont they grow on trees???? ?....lol.....you are so creative...love your work!! !..and looking at it...over and over again!! Oh what a beauty;O) I just love your work, beautyful details, and lovely finnish, so clever.. Happy Easter Mel! Your work is always so 'eggceptional'! Many blessings and hope you have a beautiful day. Your work is wonderful, everything you do amazes me. YOu are so nice to share with everyone. This little rabbit is just adorable. Happy Easter, hope you have a wonderful day. Charles' Carrot tree is fab. Another outstanding creation! Very cute! I love your carrot tree! Very creative, Mel!!! Now this is just as sweet as can be!! 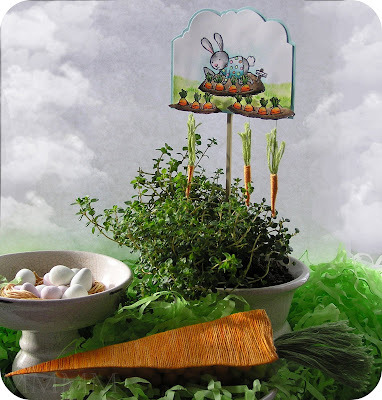 :) Love the carrot idea and I hope your Easter was wonderful!! TFS! Where's the mini rabbits to eat the mini carrots? ;o) Cute bunny stamp! I love your bunny...shame on you enabling us like that! I treated myself to paper stackers so no stamps for awhile...like I don't have enough already...but......always room for one more. Hope you're feeling better...such a creative mind you have! !